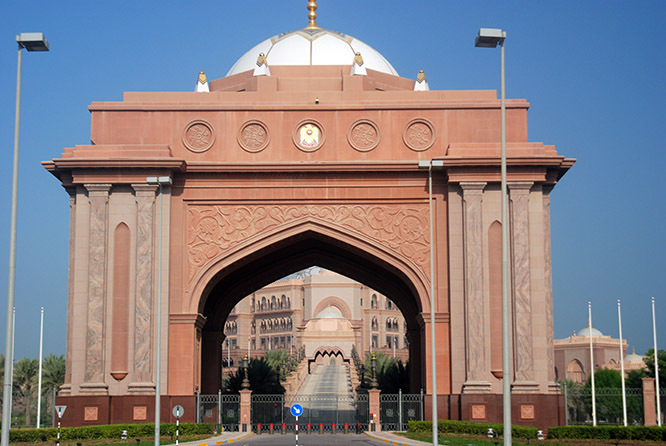 The capital of UAE is the city Abu Dhabi and is located in the center of the country along the northern coast. With Dubai getting all the attention, Abu Dhabi is seen more of a destination for business travelers rather than tourists. 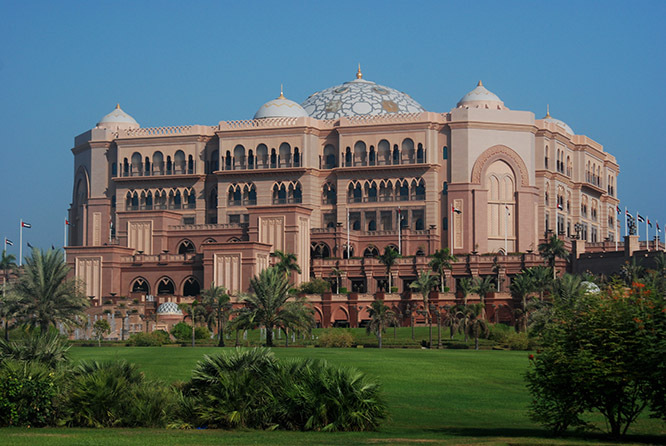 When I stumbled across the ‘Emirates Palace’ seen above, I honestly thought it was a government building or residential area for the royal family. As it turns out, this is actually a luxurious hotel for the rich! I can’t imagine what a room cost per night here, but I have a feeling the cost would be enough for me to back pack a subcontinent or two. 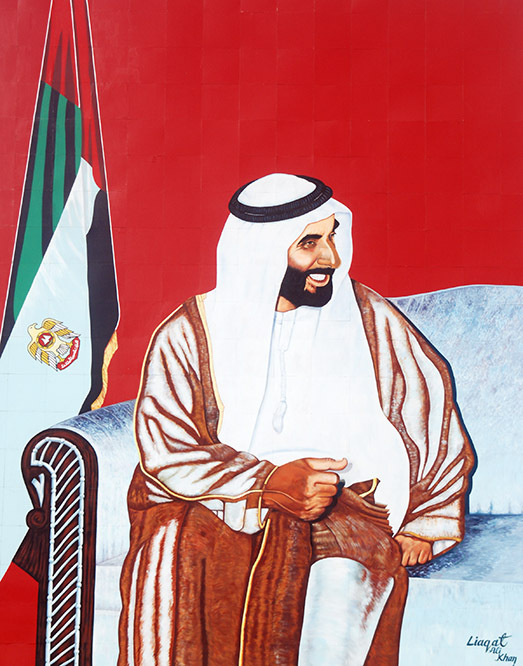 Right by the luxury hotel was a large painting of Zayed bin Sultan Al Nahyan. I suppose seeing the king so close to the hotel was what made me believe it was one of his palaces at first. I actually do assume originally it was a palace before being converted over. Zayed bin Sultan Al Nahyan is considered to be the one who united the Arab Emirates together, and is credited for modernizing it as well. 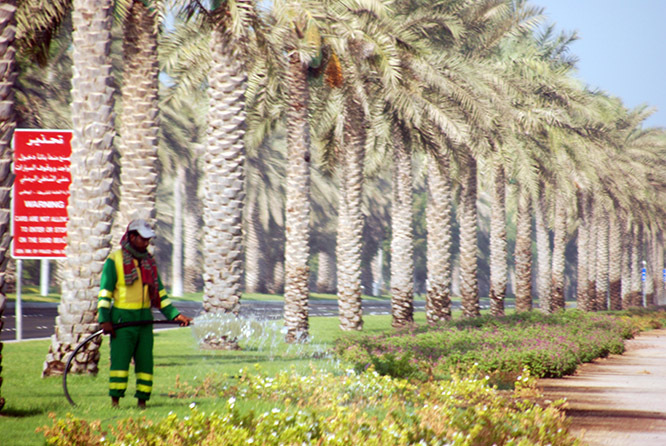 Above is a worker attending the gardens to the Palace Hotel. Notice how he is wearing a uniform with reflecting bands. This alone shows how well organized and structured the UAE is, unlike some of their more turbulent neighbors! It’s one of the cleanest countries I’ve ever been to, and for sure has some of the highest standards in the world. 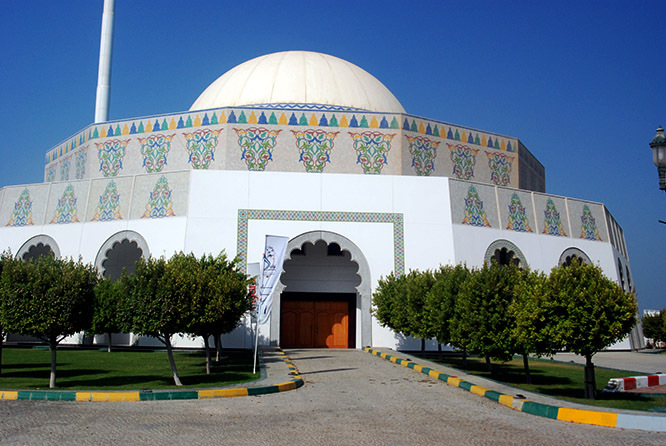 The UAE is an Islamic nation, but with it being so open to the western world I had expected it to have lost much of its culture and tradition. I was surprised that this wasn’t the case; UAE does a good job of maintaining Islamic law while also being relatively open. I visited during Ramadan when Muslims fast during the day. I was also in Afghanistan during part of Ramadan and it was difficult to find food, but in the UAE almost all restaurants are still open but with carry out only. This way Ramadan is still honored by keeping people from eating in public and non Muslims can still keep their normal diet. 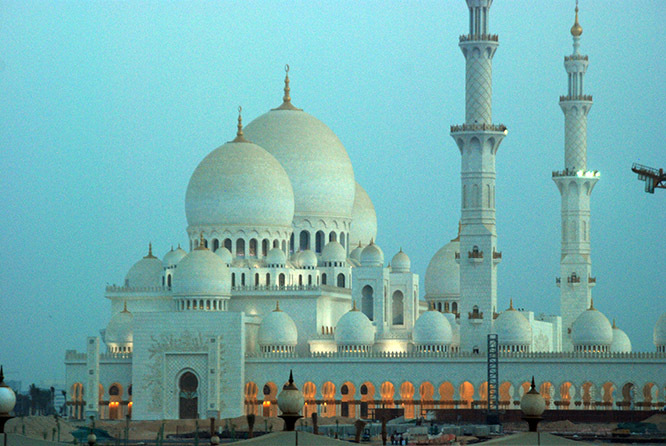 Above and below is Sheikh Zayed Grand Mosque that is just outside the city limits in Abu Dhabi. 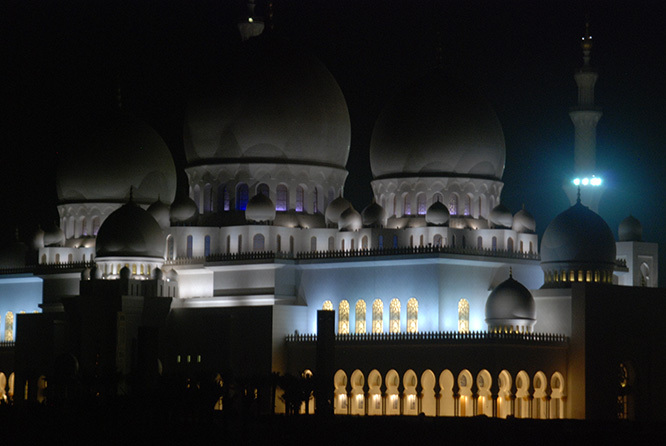 I came across the mosque a few times while renting a car so I took the photo above in the morning and the one below at night. Downtown Abu Dhabi is filled with dozens of colorful high rise buildings. 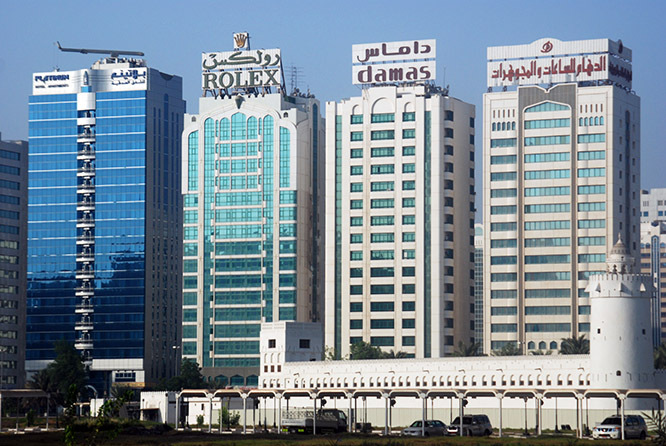 You can look at the names of these buildings and tell they are all high dollar brand names such as Rolex or Damas. 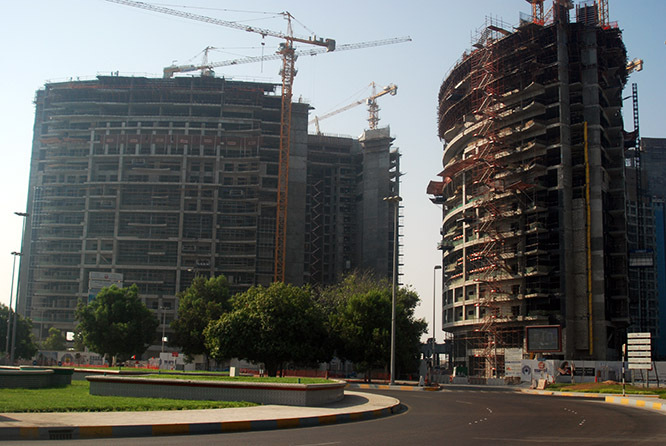 I visited as the country was towards the end of their construction boom. Everywhere I went it seemed that new buildings were still being added. 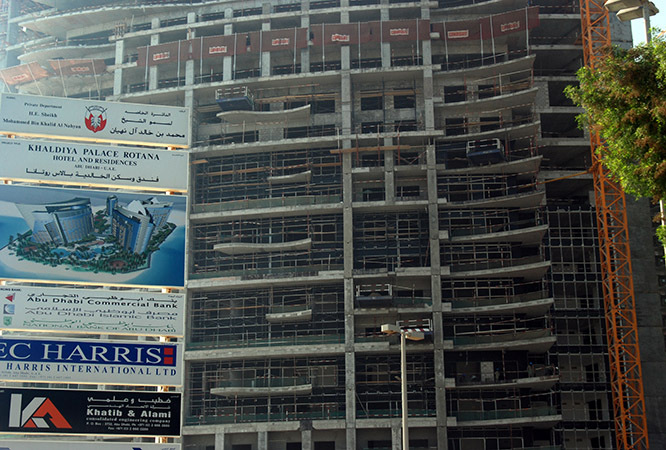 A few years after I visited, the UAE suffered with the rest of the world from the Great Recession. I wasn’t here at the time, but my understanding is that several construction projects were abandoned and parts of the country even needed a bailout! Other more practical projects that benefit the average person like myself are all the city parks. When you’re doing a lot of walking in the summer heat, the city parks provide some shade and needed relief from the hot sun. 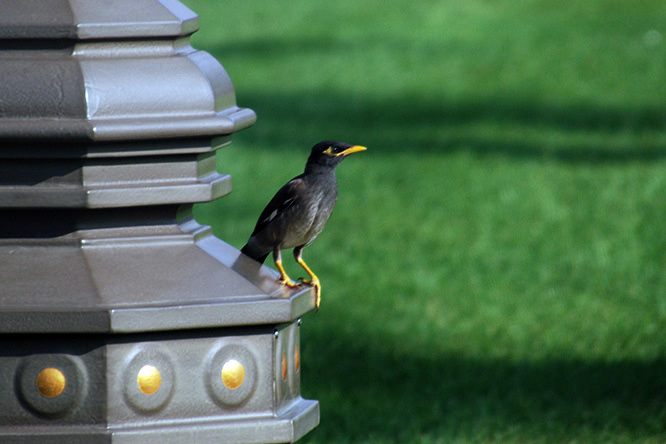 The parks weren’t exactly teeming with wildlife, but this bird above seemed common all over the country. I expect it’s like seeing a crow or sparrow back in the US. 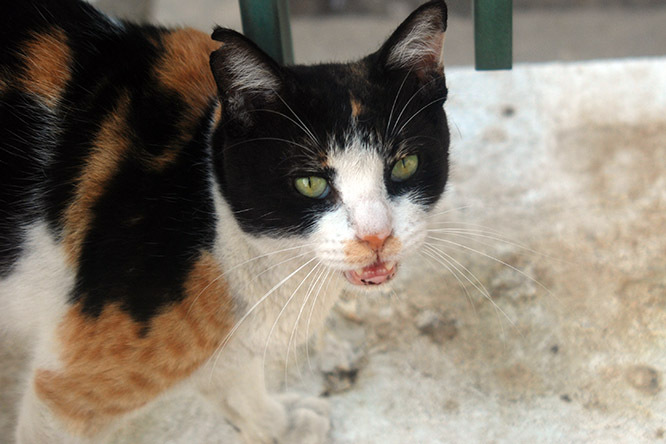 Cats were also in huge numbers throughout the parks. At first I wondered how they survived out here in the heat, but then I remembered cats are originally desert animals, so they’re in their natural habitat.